Kid Sense is dedicated to helping new graduates successfully enter the paediatric workforce. Come along to learn the tips and tricks to getting and keeping your first position in the exciting world of paediatrics! 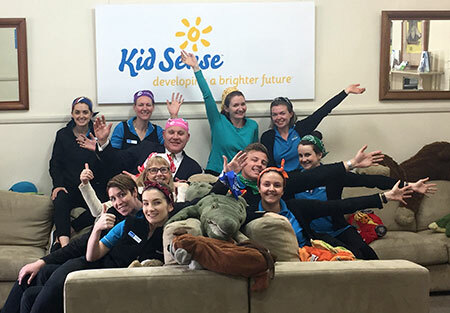 Kid Sense is a rapidly growing company that is actively seeking like minded Occupational Therapists or Speech Therapists specialising in Paediatrics to join the expanding team. So if you are interested in joining our team, please call 1800 543 736 and speak to Jude (Practice Manager) for more information. At Kid Sense our vision is to create the most trusted brand in child development in South Australia. To do this, we need passionate and experienced people who love working with children. So what can we offer YOU and why should you choose Kid Sense? Don’t like Monday mornings? We don’t either! We give you Monday mornings free until 12 noon to organise things in your week. Do you spend an inordinate amount of time booking appointments and doing basic administration? We want you to do what you do best – treating clients, so we provide an active operations team that takes care of administration (photocopying, scheduling, billing etc) leaving you to do what you love – therapy! Don’t feel stimulated in your work place? We provide a team office environment where you can collaborate with other clinicians, disciplines and your supervisor. Seeking Professional Development? We provide weekly (and daily if requested) supervision and coaching from your (office sharing) supervisor to ensure we are growing your skills. We also host weekly staff meetings that provide Professional Development: fortnightly as an entire clinical team and fortnightly in your specific discipline team. Want to learn about other professional areas? We provide a multi-disciplinary team on site for easy professional development be it formal or informal over lunch or coffee. We like to be social so we provide common lunch times when we all get together as a team as well as out-of-office hours social opportunities that are focused on team bonding and lots of fun. PS. We do have some ‘master chefs’ in our team so cooking and food are generally common conversation points, along with a deep love of animals. Do you like up-to-date, fast and user-friendly technology? We aim to simplify administration and provide use of a laptop during all therapy sessions for progress note writing and review as you go, eliminating the need for out of office hours administration. Want to be part of a team that practises ‘best practice’ methodology? We have a highly professional, systemised, organised and ‘low paper’ working environment where creativity, innovation, technology and team work are strongly encouraged. Want to dress comfortably and professionally? We provide a uniform so there no need to ‘think’ on rushed mornings about how to look professional. Worried about just being ‘thrown in’? Don’t worry, we have a structured ‘internship’ and induction program where we support you every step of the way. We are invested in ensuring ‘best practice’ therapy by our therapy team for each and every client, so therapist support is an essential part of this process. Worried about parking? Don’t be – we have free onsite car parking. Want to feel that you are valued, liked and that you are paid well? We have very competitive terms and conditions of employment to ensure we attract the best people to our organisation. Want to be part of an amazing team? Visit our NEWS page to see the teams achievements. Are passionate about client service and the work that we do.